A Juan Foyth header was enough to give Tottenham a narrow 1-0 win over Crystal Palace at Selhurst Park. Both sides created their fair share of chances through the first half, however neither gave the keepers much to do in what was a sluggish first period. Coming out for the second half it was Palace who made the stronger start, but it was Tottenham who got themselves in front. ​Harry Kane got on the end of an Erik Lamela corner, only to have his header blocked by Luka Milivojevic. Luckily, the ball fell kindly to central defender Foyth, who headed home from close range to put his side 1-0 up. Both side's defences performance superbly, and in the end one goal was all that was needed for Mauricio Pochettino's men as they snatched a narrow 1-0 win. Wilfred Zaha was ruled out with injury prior to the game, and it was clear for all to see that ​Crystal Palace missed his presence going forward. They did look threatening at times, but they lacked a cutting edge to their attacking play and will rue a number of golden opportunities they squandered. It's no secret Palace thrive with Zaha and struggle without him, but fans will certainly be left wondering what could've been had they have had their star man available for selection against a fairly inexperienced Tottenham back line. They'll hope he's back sooner rather than later, with an international break coming up giving the Ivorian more time to recover and get back to full fitness ahead of Palace's return to ​Premier League action. Starting XI: Hennessey (6); Wan-Bissaka (8*), Tomkins (7), Sakho (7), van Aanholt (6); Kouyate (6), Milivojevic (7), McArthur (7); Townsend (6), Ayew (6), Meyer (5). Substitutes: Kelly (6), Schlupp (6), Sorloth (6). STAR MAN - He'll be disappointed to be on the losing side, but Aaron Wan-Bissaka continued to impress with yet another solid performance. Matched up against Ben Davies and the dangerous Lucas Moura on the right hand side, Wan-Bissaka kept both men quiet for the majority of the game and put in some key challenges to prevent goal scoring opportunities. Moura was subbed off with 20 minutes remaining after being largely ineffective getting at the right-back, and fans are really beginning to take to the young Englishman after a spell of promising performances. WORST PLAYER - He's begun to work his way into the starting 11 in recent weeks, but Max Meyer did himself no favours today. He was largely ineffective and in a game where both defences were resolute and hard to break down, Meyer struggled to make an impact on the game. His night was ended with 20 minutes remaining, and it'll certainly go down as a performance he'll want to forget in a hurry. With Jan Vertonghen ruled out of the game and with Kieran Trippier being forced off with injury less than half an hour into the game, it was going to be a tough ask for ​Tottenham's backline to eliminate Palace's attacking threat. However, they more than stood up to the task. They defended resolutely all game and were able to keep Roy Hodgson's men at bay, despite their late onslaught on the visiting goal in search of a late equalising goal. Even with some questionable goalkeeping from Lloris at times which didn't help matters, Tottenham were brilliant at the back and did just about enough in the final third to secure a narrow but important win. Starting XI: Lloris (7); Trippier (6), Foyth (9*), Alderweireld (7), Davies (7); Sissoko (7), Wanyama (6); Lamela (6), Alli (6), Moura (6); Kane (6). Substitutes: Aurier (7), Son (6), Winks (6). 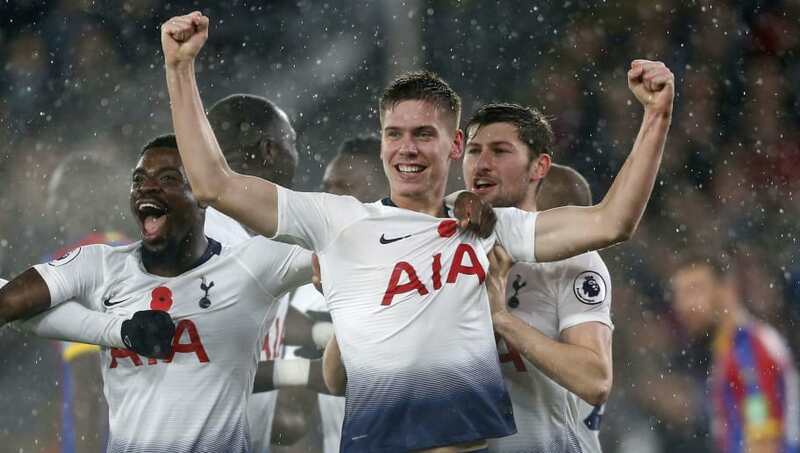 STAR MAN - He was the villain in their last game against Wolves, having given away two penalties, but Foyth may just have won the fans back with an outstanding performance on the night. He was very strong in defence, dealing with everything which came his way, and ultimately made the difference in the game at the other end. His close range header was enough to win his side a valuable three points which closes the gap on the top three in the league. WORST PLAYER - In what was a fine defensive display from Tottenham, Victor Wanyama had a fairly quiet game. He didn't necessarily have a bad performance, but he never looked to leave his mark on the game and didn't offer much going forward. I hope Wanyama improves. He hasn’t been the same since that big injury. He did enough to help his side see off Palace and win all three points, but he and the fans will be hoping for a much improved performance after the international break. Palace fans will be frustrated after the narrow defeat, and things don't get easier for them as they will now face Manchester United at Old Trafford, whilst Tottenham will be looking to make it five consecutive wins in all competitions when they take on Chelsea after the international break.